Publish or Perish: Generosity All Round. Well I am endlessly amazed by the generosity of this bloggy community. As you know I have just recently had the pleasure of announcing the availability of my new novel Veiled in Shadows (incidentally I have a giveaway running at the moment for which a copy is one of the choices of prize). It is in relation to this that I am talking of our “little” community’s generosity. First when I asked for reviewers I had people stepping straight forwards to offer reviews. This is very far from the potential experience for an independent first timer like me. It would have been all too easy for my request to have been greeted by deafening silence. Then Christy Pinheiro sent me a copy of her new book The Official Indie Book Reviewer List. As a self published author Christy has put a lot of thought and effort into developing a resource to help self publishers get their work reviewed. She has had a list of reviewers available for some time on her website. Recently though, Christy has put even more effort into turning her list into an e-book which gives more details on each of the reviewers. If you are interested Christy has the e-version for sale at 99 cents. I am hoping to get at least another half dozen reviews from Christy’s list so I think it is a great resource for people looking for reviews, check out her website. Then when I got home tonight I found a Royal Mail package from the UK. 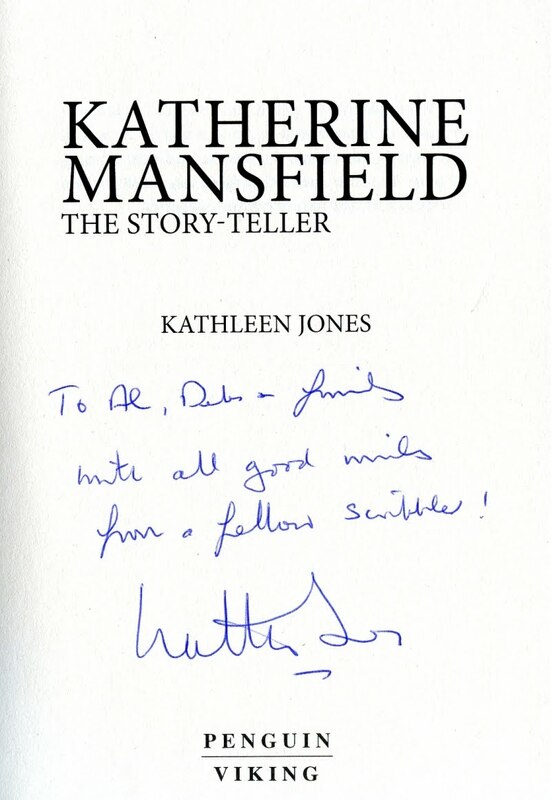 The return address was Kathleen Jones’ and inside a copy of her beautiful new biography Katherine Mansfield: The Story Teller. For those of you who don’t know Mansfield is considered to be one of the leading short story writers of the early 20th Century. She had an unconventional life before dying tragically young of tuberculosis. Kathleen initially asked for a copy of Veiled in Shadows to review. Then almost immediately she emailed me back to say she would buy her own copy to save me some cost. In the meantime I had already ordered a copy to go directly from The Book Depository. 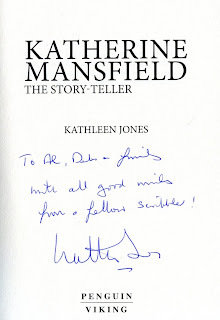 Kathleen’s response was to say that she would send me a copy of her book as a thankyou. To say I am impressed is to understate the matter. A beautiful hardback by a feted British biographer in exchange for my paperback. And Kathleen has made a lovely note in the frontispiece. Somehow I think I got the better end of the deal. I can’t even do Kathleen the favour of saying go out and buy a copy. Due to the downturn in publishing Kathleen’s UK publisher have pulled out. 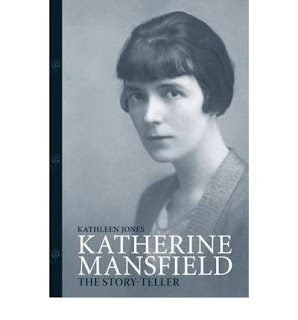 At the moment Katherine Mansfield seems to be available only in New Zealand. It’s not on Amazon, while the Book Depository have a page it lists as “out of stock”. Fortunately, it looks like The Edinburgh University Press may shortly bring out a UK edition. In the mean time I highly recommend Kathleen’s blog it’s one of my favourites. Finally, I promised more of about my odd youth. It will post more soon, I promise. Bless you Al - such nice comments. I won't stop blushing for hours! The power and generosity and general loveliness of the blog community is something that always always amazes me - hence I'm still here blogging away!! I seriously would have gone bye-bye a very long time ago (like with Facebook etc) until I realised just how different blog communities are - full of genuine and really lovely bloggers!! It is great that you're getting such wonderful support! Very cool. and it looks like an excellent resource to get books reviewed. Thanks for spreading the word about this resource, Allan. I forgot to mention that the profits go to charity; a homeless shelter in Sacramento called Loaves and Fishes. Thanks again for adding a link! I'll check out Kathleen's blog - she sounds like a wonderful person. And I agree, this whole blogging community is so generous and supportive - I feel so blessed to be a part of it! this is another awesome post. I suspect my self-published book shall be out soon as well... It is an awesome task! But I am now off to get a couple more book with many thanks to you.. I've racked my admittedly sorry excuse for a mind, but can you get your book on amazon? You are most welcome, and indeed most deserving! All the praise I gave is well deserved! You’re right, people certainly put more of themselves into blogging. Indeed yay for Kathleen and Christy. It is wonderful. Christy’s resource is very handy! You are most welcome and thank you once again! Do have a look at Kathleen’s blog , it’s one of my favourite! It is a great community. That is great news, I hope your book does well! Yes, Veiled in Shadows is on Amazon. There should be a link on my sidebar.